The 1984 World Series will always be remembered as a mismatch, with the Tigers -- winners of 104 games during the regular season -- trouncing the upstart Padres in only five games. In reality, though, the Padres made a fair accounting of themselves. In the very first inning of the Series, Detroit collected four base hits, but scored just once. Then in the bottom of the frame, San Diego grabbed a 2-1 lead on Terry Kennedy's two-run double. It was still 2-1 in the fifth when Larry Herndon homered with two out and a man on, giving the Tigers a 3-2 edge. That's how it ended, as Jack Morris held the Padres scoreless after the first inning. San Diego showed life in Game 2, bouncing back from a 3-0 deficit in the first inning for a 5-3 triumph to even the Series. Relievers Andy Hawkins and Craig Lefferts held the Tigers to just two hits after the first frame, and DH Kurt Bevacqua blasted a three-run homer in the fifth. Tiger third baseman Marty Castillo, who hit only four home runs in the regular season, got Detroit started in Game 3 with a two-run homer in the bottom of the second, and the Tigers tacked on two more later in the inning. That was all they'd need, as Milt Wilcox and a pair of relievers combined for the 5-2 Detroit victory. 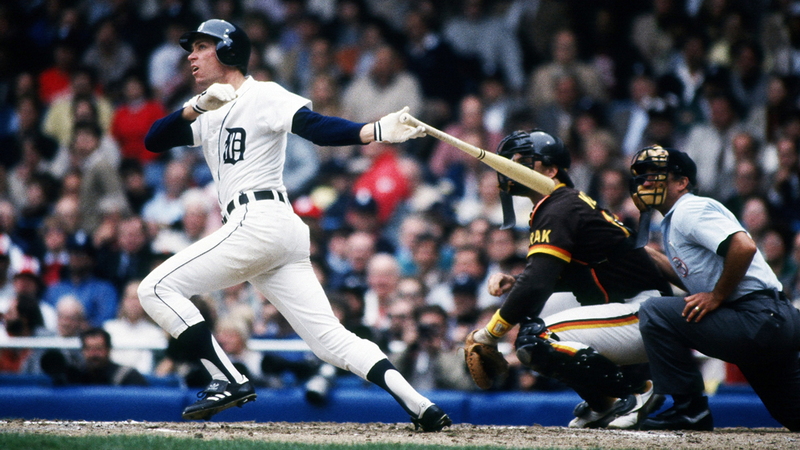 Game 4 was all Alan Trammell, as the Tigers' All-Star Game shortstop clouted two-run homers in the first and third innings, accounting for all of Detroit's runs in their 4-2 win. As he had in Game 1, Jack Morris went the distance. Kirk Gibson got the Tigers started in the first inning of Game 5 with a two-run round-tripper. The Padres fought back to tie the contest at three-all in the fourth, and after scoring a run in the eighth they trailed by just a run, 5-4. Then Gibson struck again, this time with a three-run blast into the upper deck in right field. That made the score 8-4, and that's how it ended. In the very first inning of the Series, Detroit collected four base hits ... but scored just once. Then in the bottom of the frame, San Diego grabbed a 2-1 lead on Terry Kennedy's two-run double. It was still 2-1 in the fifth when Larry Herndon homered with two out and a man on, giving the Tigers a 3-2 edge. That's how it ended, as Jack Morris held the Padres scoreless after the first inning. San Diego showed life in Game 2, bouncing back from a 3-0 deficit in the first inning for a 5-3 triumph to even the Series. Relievers Andy Hawkins and Craig Lefferts held the Tigers to just two hits after the first frame, and DH Kurt Bevacqua blasted a three-run homer in the fifth. Tiger third baseman Marty Castillo, who hit only four home runs in the regular season, got Detroit started in Game 3 with a two-run homer in the bottom of the second, and the Tigers tacked on two more later in the inning. That was all they'd need, as Milt Wilcox and a pair of relievers combined for the 5-2 Detroit victory. Game 4 was all Alan Trammell, as the Tigers' All-Star Game shortstop clouted two-run homers in the first and third innings, accounting for all of Detroit's runs in their 4-2 win. As he had in Game 1, Jack Morris went the distance. Kirk Gibson got the Tigers started in the first inning of Game 5 with a two-run round-tripper. The Padres fought back to tie the contest at three-all in the fourth, and after scoring a run in the eighth they trailed by just a run, 5-4. Then Gibson struck again, this time with a three-run blast into the upper deck in right field. That made the score 8-4, and that's how it ended.